The last picture from this church. 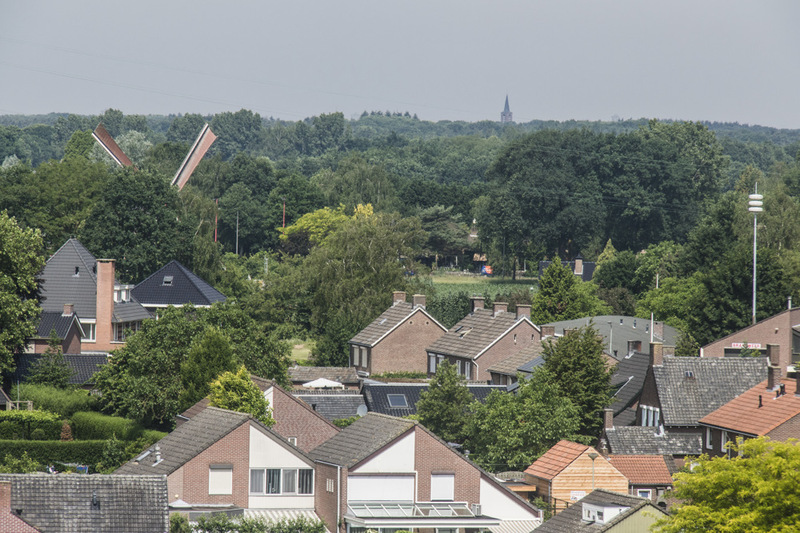 This was taken from the bell tower and in the distance, the Sint Antonius Molen (windmill) or at least its vanes can be seen. We will visit it. Nice. I like that little peek at the windmill. Ayush Basu: It is a fine thing as you can see in the coming posts, Michael. A wonderful view from here, Ayush!! Ayush Basu: I doubt a whole lot of people visit up here frequently, Elizabeth. Avant l'église, je remarque la présence d'un moulin qui de ce qu'on voir, semble parfaitement entretenu. Ayush Basu: This is a peaceful and scenic place, Pascale. I hope you will like the coming shots of the mill. Ayush Basu: The Persians were apparently the first to invent the windmill but the Dutch took it to a whole new level, Bill. The Netherlands appears a very civilised place to me Ayush. Ayush Basu: As I am sure you experienced first hand when you visited Astrid and Ginnie, Chad. What a fine looking village, I can't wait to see the windmill. Ayush Basu: Thank you for the enthusiastic comment, Brian. Ayush Basu: Yes, Sherri, and to think, at some point of time, there were over 10,000 of them. The church on the horizon, could be in Helden (I think). You should have Germany to your back. Ayush Basu: You are absolutely right, Louis! I have not been to Helden yet. Have you visited this part of the Netherlands? the lens you are using seems to bring the distance close... interesting effect, and a beautiful picture, Ayush! Ayush Basu: I pretty much zoomed in all the way, Elaine. It is not that close but of course it is not too far off as well. Ayush Basu: I liked the view too, Peter. And as Louis indicated, that is a village/town by the name of Helden. That's a weird looking pole on the right! Ayush Basu: Now that you draw my attention to it, I have no clue what it is, Tom. This is a wonderful view from the church. I looked around on streetview and noticed also a "castle" close by. This looks like a nice little town at the Maas. Ayush Basu: The view from the tower is quite unblocked. You are right, Astrid. I have some shots from there too and will put them on sequence too. This is a lovely aerial shot. Ayush Basu: I thought so too, CP. I doubt a whole lot of people visit up here frequently.